Get Ready to Learn the ABCDE’s for Healthy Skin & Cancer Prevention! Skincare safety measures are not limited to sunny weather conditions. Conducting self-examinations, applying sunscreen, and having annual dermatological checkups are proactive steps to be taken throughout the year. Staying informed on skincare and performing monthly self-examinations are significant for healthy skin and cancer prevention. According to the Skin Cancer Foundation self-exams help identify potential skin cancers in the early stages when it can be cured. 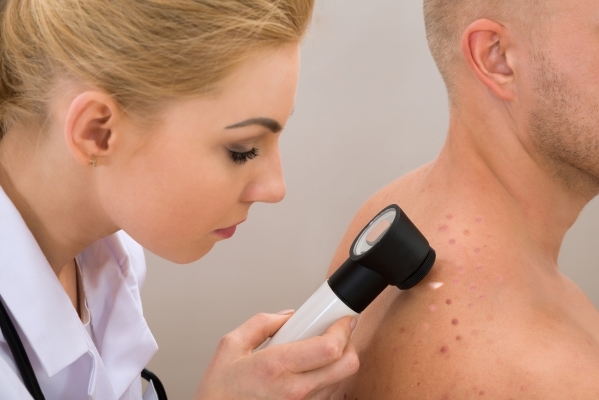 The American Academy of Dermatology (AAD) comments on the importance of early skin assessments noting, “It is estimated that one in five Americans will develop skin cancer in their lifetime. When caught early, skin cancer is highly treatable.” The AAD goes on to outline the ABCDE’s assessment guideline used in determining normal versus cancerous skin conditions. Get ready to learn the ABCDE’s for healthy skin and cancer prevention! A- Asymmetry: Benign (non-cancerous) moles are symmetrical in shape. If one half of the mole doesn’t match the other half it can be a warning sign of melanoma. B- Border: Moles with irregular, blurred, or ragged boarders should be further evaluated for melanoma. C- Color: Benign moles are one color throughout. Color variations from one area to another should be further evaluated. According to the AAD color shade variations include tan, brown, black, and sometimes white, red, or blue.